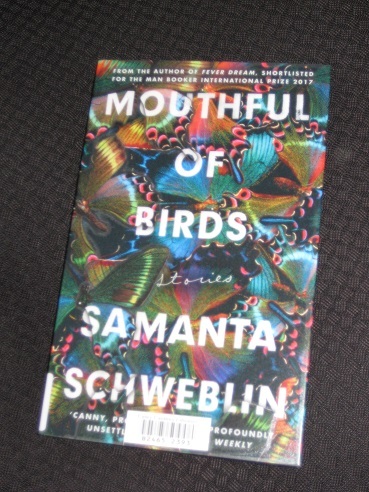 Schweblin’s creepy, fast-paced novel Fever Dream was one of the highlights of my 2017 reading, so it was little surprise to see this one make the 2019 longlist. Mouthful of Birds, a collection of twenty stories running to around 230 pages, is actually an earlier work, but there’s a lot connecting it to the novel, including the writer’s ability to unsettle the reader, with characters behaving in rather strange ways. There’s a wide range of situations on display, with few actually pinned down in terms of time and place, but it’s fair to say that most of them are a little… well, unusual. Eerie is a word that comes to mind when describing Schweblin’s work, and there are several examples of that here. From the opening piece, ‘Headlights’, featuring moaning phantom women by a deserted highway, to ‘On the Steppe’, in which a couple on the hunt for an unspecified creature meet up with another couple who have already achieved their goal, the writer delights in creating bizarre situations that disturb the reader. In addition, as is shown in ‘Underground’, a story of the mysterious disappearance of children in a mining town, Schweblin is never afraid to end a story without revealing any of its secrets. Although I recognize the relief, my legs are shaking. I almost feel like we could die, all of us, for some reason, and I can’t stop thinking about what’s wrong with Walter, what it is that could be so terrible. In a story with a cheery tone, success leading to success, the narrator’s brother still manages to send shivers up the spine. “Are you going to dig?” he repeated. However, when Schweblin gets this Kafkaesque mood right, the results can be excellent. The last, and longest, story, ‘The Heavy Suitcase of Benavides’, begins with a mentally ill man murdering his wife, yet when he lugs her body over to his doctor’s home in a suitcase, the reactions his crime elicits are definitely not what you’d expect. Another of the better stories is ‘Toward Happy Civilization’, one with Kafka’s fingerprints all over it. Here, a man at a country train station is unable to buy a ticket because he has no change. What follows is a stay in a town where the train never stops, working together with a group of men who find themselves unable to leave. With her back to us, standing on her tiptoes, she opened the cage and took out the bird. I couldn’t see what she did. The bird screeched and she struggled for a moment, maybe because it was trying to escape. Silvia covered her mouth with her hand. When Sara turned back to us, the bird wasn’t there anymore. Her mouth, nose, chin, and both hands were smeared with blood. Not for me. Most of you will know my preference for (lengthy) novels by now, and a short-story collection has to be really top-notch to get my seal of approval. There are some excellent stories in Mouthful of Birds, but there’s also a fair amount of padding, with some efforts forgotten once the page is turned. I suspect that this wouldn’t have received as much attention if it had been published before Fever Dream, and I don’t think it should go further here. Having managed to extract ourself from some pretty sticky situations, we head on to yet another. The next leg of our journey will take us to North Africa, where a couple of tourists on a voyage of discovery end up with far more than they bargained for. That’s right, kids – it’s another book about death. See you on the other side (of the Mediterranean…). I gave it a 3 star. It also reminds of “things we lost in fire” in many places. So a comparison always comes up and that also works against it I guess. As you know, I found the stories evil and disturbing. Not one had any moral redemptive quality, and I refuse to see life like that. Her writing is powerful, but for me, the content ruins this book. I am not suggesting we read only uplifting, life-affirming books. The Four Soldiers, for example, has imminent death as a central theme for me. But, it is entirely different than the evil darkness Schweblin is so adept at writing. Perhaps one or two stories at a time would have been more palatable; all at once they were too dark for me, with not one spark of hope. At least the soldiers had their friendship, the pond, the comfort of one another. Bellezza – Hmmm, that’s where I have to disagree as ‘Four Soldiers’ was simply too nice for me for a book that really needed to have more grit in it. For me, it portrayed the boys’ innocence, and youth, perfectly. I thought a half dozen of these stories exhibited the talent shown in Fever Dream. Some were downright amateurish and many others were more brutal and grotesque than effective. Overall, it was an uneven collection for me, and I would be surprised to see it on the shortlist. If it makes it there, however, I’ll read it again – otherwise, I won’t be re-visiting this one. Scott – I did hear that not all of these were in the original version, with a few being added extras for a later edition. The best stories are very good, but not all of them are at that level.